Piglette presents a carefully selected choice of birthday gifts which we are sure will be loved by everyone. We have been searching high and low for quality gifts so that you don't have to spend hours hunting around yourself. Whether you are looking for electronic gifts for the home or office, bonsai plants or flowers, or even unusual presents like a past-time pinball-style baseball game or a personal weather forecaster, you'll find it all here at Piglette! Simply click on the pictures below for more details of the gifts shown. This magnificent bubble lamp turns on to light the way for hours of innovative entertainment. The invisible, silent air pump creates shimmering bubbles. Buoyed by the bubbles, the artificial fish "swim" up, down and all around. The light enhanced kaleidosope of bubbling water constantly changes color as light from the built-in lamp gently shifts from blue, to red, yellow and green tube. The size of this wonderful gift is 28 inches tall. Brighten up someone's birthday with a shimmering array of bubbling light. 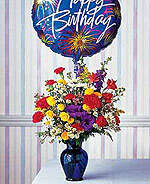 Send a messsage of happiness with this joyful Mylar Happy Birthday balloon and flowers. This explosion of colorful flowers, along with a foil balloon, adds just the right spark to any birthday celebration. The firework of a bouquet including carnations, larkspur and chrysanthemums arrives in a blue glass vase with attached "Happy Birthday" message balloon. Size is approximately 15" W x 19.5" H.
These birthday flowers delicately compliment the Mylar balloon soaring above! Keep in touch with Mother Nature! Know the ExactSet™ precise time, the local forecast, the relative humidity, the barometric pressure, day and date all from the comfort and convenience of your home or office. The Oregon Scientific BAR122HGA Weather Forecaster with Thermo-Hygrometer and ExactSet™ Clock Multi-channel barometer allows you to monitor the temperature and humidity in up to three remote locations. This impressive Wireless Personal Weather Forecaster has an operating range of up to 300 feet! Features a daily wake-up alarm with 2-minute crescendo and pressure trend indication – rising, steady, or falling. Kinetic movement icons display the forecast for the next 12-24 hours: Sunny, Cloudy, Partly Cloudy, or Rainy. more features include ExactSet clock with split-second accuracy, user selectable hi/low indicators for temperature and humidity. Easy to understand graphical icons display weather forecast. Works with THGR268 and THC268 actual size: 3.5x1.5x5.25 Cable Free™. Planted in red lava rock, this beautiful bonsai tree makes a unique and unusual gift. Tiny umbrella shaped leaves form a dense green canopy on this versatile bonsai, suitable for home, office or virtually anywhere. 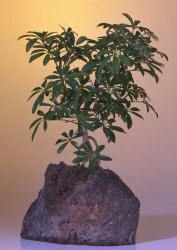 The Hawaiian umbrella bonsai tree is extremely easy to care for and thrives in both low and high lighting conditions. Buy this beautiful miniature evergreen for a living, lasting gift for someone special, or check out Piglette' choice of more great little bonsai trees. A stylish old-style gift. First there was instant potatoes. Now there is the instant heirloom!! The Old Century Baseball Game is indeed a handsome, highly detailed game built to last with crafted aged wood!! This fun-filled game transports you and your loved ones to a simpler time. Gather around and forget the need for any batteries! Enjoy the pinball style action as you go for singles, doubles, triples and yes even the Grand Slam! However, beware of the Outs! Give your home decor a home run with the Old Century Baseball Game. Adorn your coffee table with this great past-time, conversation piece!! Indulge someone special with a luxurious gift of champagne! This opulent champagne basket is a perfect gift idea - whether it’s a birthday, anniversary, holiday, promotion or just another day of the week. The two splits of Chandon Brut (187 milliliters each) sparkle with crisp, fresh flavors. The Saraivanov Caviar (1.75 ounces),creamy Brie cheese spread(3.75 oz), and crisp crackers (1 oz) complement the champagne and allow its subtleties to shine. It is a perfect mini-celebration for any occasion, and makes an ideal birthday gift basket! Enjoy it at the beach, on a tablecloth in the countryside, or in the comfort of your own home. Your gift measures 11" x 10.5" x 7.5", and weighs 5 pounds. Due to the alcoholic content of this gift basket, an adult signature is required upon delivery. Please click on the photographs for prices of any of the fantastic birthday gifts above. Please bookmark Piglette's Fractal Universe Online Flowers and Gifts for a great selection of flowers, jewelry, electronic gifts, plus unique and unusual presents available to buy online at great prices. Internet Explorer users can bookmark Piglette in just two clicks.